Activate your free EXCHANGE Rewards program by clicking the button below to log into your Safety Products Inc online account and accepting Terms and Conditions in Exchange. Click here to set one up now! 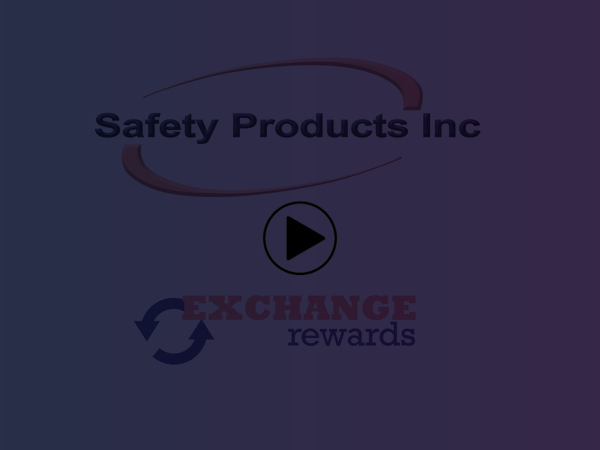 Every time you make a purchase from Safety Products Inc, points will automatically deposit into your EXCHANGE account. The more points you earn, the more rewards you can redeem! Activate your free EXCHANGE Rewards membership by signing into your SPISafety.com online account and accepting Terms and Conditions in EXCHANGE. Points will automatically deposit into your EXCHANGE account with every purchase of products. Receive 1 point for every dollar spent on merchandise. Look for select items and special days to earn Double Points. View your points by logging into your SPISafety.com account. Redeem your points in the rewards catalog with hundreds of options. We hope you enjoy your Free EXCHANGE Rewards membership and all of the benefits it brings. Two of our most popular redemptions are credit vouchers to purchase Safety Products Inc products or services and Visa debit cards. There are literally hundreds of other options such as electronics, sporting goods, housewares and more! Don’t let another order be pointless... get started today! Safety Products Inc Visa Prepaid Cards are issued by MetaBank®, Member FDIC, pursuant to a license from Visa U.S.A. Inc. This card can be used anywhere Visa debit cards are accepted within the U.S. only.